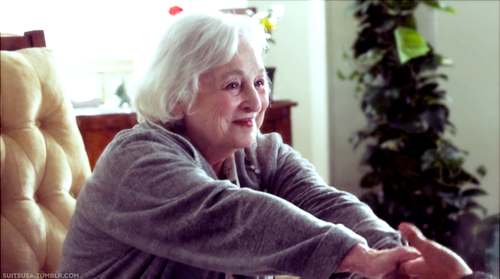 Last Scene; this is one of my favorite scenes between Mike and his adorable grandma. Mike enters his grandma’s room at the old age home. Grandma: *surprised* 3 times in 1 week! I might have to write you back into my will! Michael smiles, gets rid of his bag and stands in front of her with a serious expression on his face. “What’s wrong?” she asks her grandson. “Okay I make a trip down here to express some serious concern, and you mock me?” looks at Grandma with a sad eyes as she laughs adorably. “With love,” she smiles.